Ronan Murray: "I've always wanted to play here." Liam Buckley has boosted his Sligo Rovers squad with the acquisition of striker Ronan Murray from Dundalk. Murray's opportunities with the Lilywhites were limited to 11 appearances last year but he comes to the Showgrounds with a good goalscoring pedigree, having earned a move to POriel Park off the back of a fine campaign with Galway United, bagging 17 goals in 38 games the year they went down. "Sligo Rovers has always meant something to me," the 27-year-old Mayo man said. "It’s my closest club, I have friends that attend games, that play for the team and it is special to me. I’m not here to play in a team struggling. "I’ve signed with a view to be a big part in taking the club towards former heights. I don’t think it will be overnight. It’s a two-year project at least certainly and that is why I’ve signed for that period because I believe in it. "It’s not rhetoric or saying it for the sake of it. I’m really happy to be a Sligo Rovers player at last and more than anything I’m excited. I’ve always wanted to play here. "The 2012 league, the FAI Cups, the Showgrounds packed out. The long-term plan is to get the club at least near that. It’s a clean slate and we’ve a manager here who has a terrific track record of not just winning but of playing a brand of football that a club like Rovers love." MURRAY: It has come early #bitored fans. Ronan Murray has signed a two-year contract with Sligo Rovers from Dundalk. Regan Donelon and Kyle Callan-McFadden have also penned new contracts with the Bit O'Red and Buckley believes the arrival of Murray is a signal of their intent. "It’s a fantastic start to bringing in new faces here," the former St Pat's boss said. 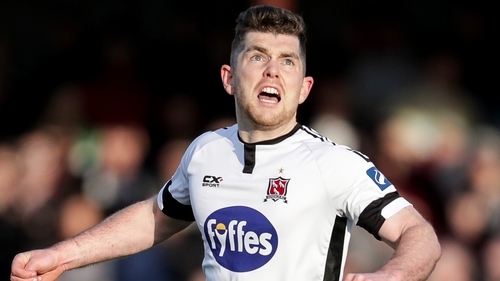 "Ronan is a terrific player, he has proven that at Galway, Dundalk and his time in England. We’re absolutely delighted to have him here. "There aren’t too many players in the league with a proven record of scoring, and certainly that are out of contract. It’s no secret that many clubs were chasing him. "It’s an ongoing process to bring in the players we want. It’s extremely competitive. We’re doing everything we can. The supporters can be assured of that. I hope it shows what we’re trying to do."